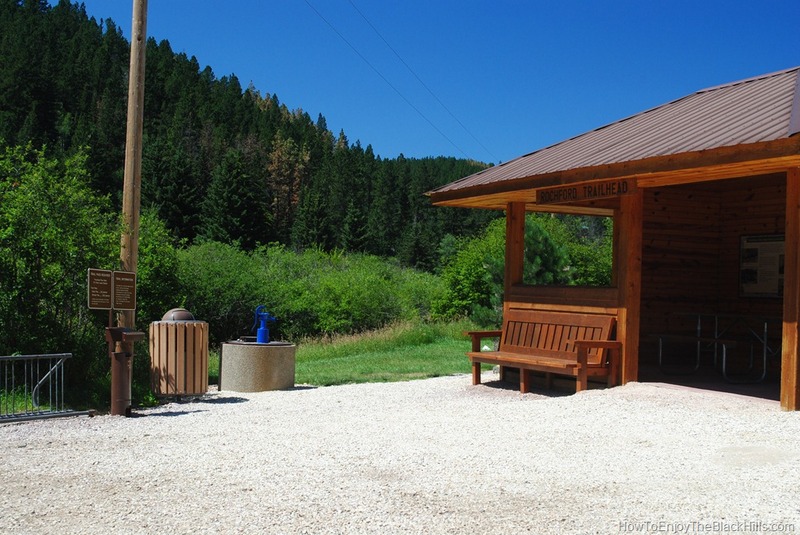 At mile post 82.6 of the Mickelson Trail you’ll find the Rochford Trailhead. Almost 9 miles to the north is the Dumont Trailhead and nearly 8 miles to the south is the Mystic Trailhead. Like other trailheads, there is freshwater during the peak season and a vault toilet. This trailhead is located right in the tiny town of Rochford SD (population 25). The Moonshine Gulch Saloon offers a place to relax and have a cold drink if you want to spend some time in town after your ride. By car, this trailhead is about 25 miles from Deadwood and about 35 miles from Rapid City. If you are going to enjoy trails in the Black Hills be sure to carry a good map like Black Hills – Northeast, South Dakota Trails Illustrated Map #751 . It will make navigating the area much easier. Also bring plenty of food and water – water is available at most trailheads during the summer – be sure to carry plenty with you though. Use of the Mickelson Trail does require a pass which you can purchase at the trailheads or here. Remember, the Mickelson Trail is not the only trail that can take you through the Black Hills, the 109-mile Centennial Trail starts at Bear Butte and ends in Wind Cave National Park. The closest trailhead of the Centennial Trail is the Pilot Knob Trailhead.